Companies that do not yet generate income. For some businesses, it takes money to make money. These businesses usually have huge capital spending requirements before they can generate income. 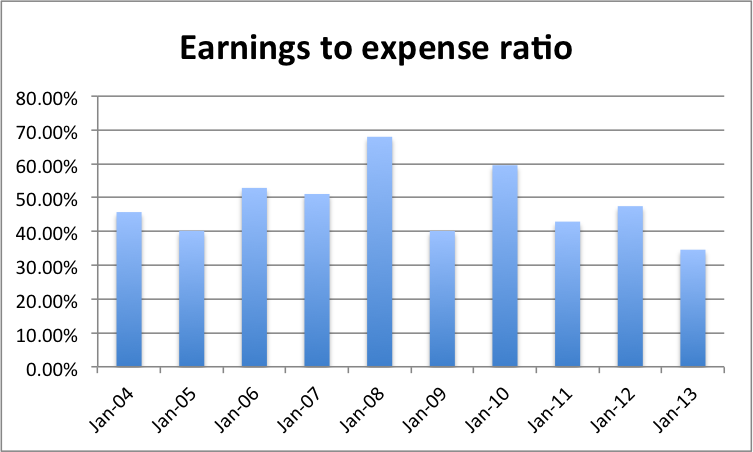 A usual characteristic of such a business is that cash expenses exceed the cash income. Companies that are notorious for diluting shareholders equity by selling extra stock to raise cash. For e.g. REIT. Companies that are in early growth phase where they are deploying most of their earned income back into business. This one might seem controversial. These are usually fast growers and trade at a premium (high PE ratios). The trouble starts when these companies hits a road block or saturation point or encounter one bad earnings season. Within a matter of few days they can lose as much as 30-50% of their value. As mentioned in my earlier post I am not adept at identifying such scenarios and would rather avoid them. E.g LULU, SODA. 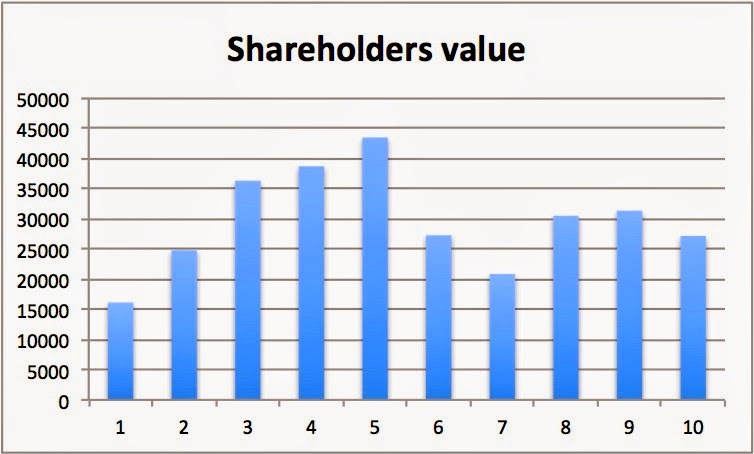 Companies where management is not focused on creating value for shareholders. For instance, Apple, an extremely profitable enterprise - until recently was sitting on ridiculous pile of cash and would not return the cash to shareholders. Microsoft exhibited the same behavior until 2003. May be the reason such companies prefer to sit on piles of cash is that they operate in fast changing/ rapidly evolving industries and management finds it comforting to sit on piles of cash rather than distribute it. Interestingly enough,I often find companies that meet all of my investment criteria except this one. Is my 'avoid' checklist perfect? Off-course not. Does it also end up eliminating awesome businesses? I am sure it does, but then again you can't kiss every pretty girl. 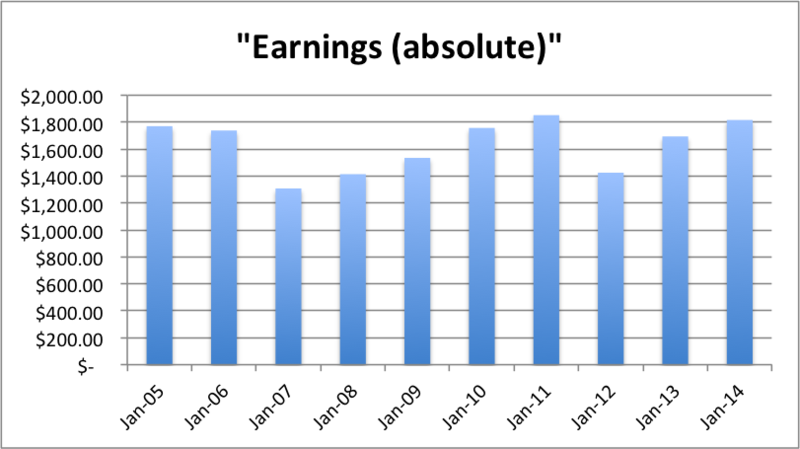 Companies that have an history of generating profits for at least 10 years. Why ten years? Ten years is usually long enough period to cover one economic cycle. 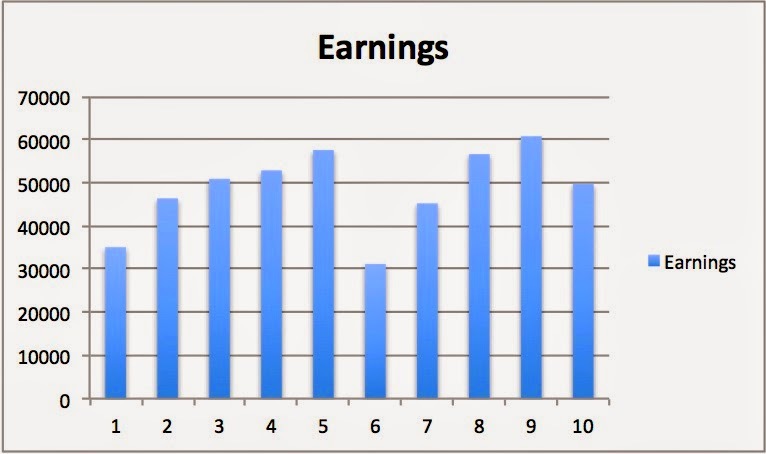 This is vital piece of information as it provides insights into how economic downturns impact the companies earnings capability. Businesses that require little money to make money. A usual characteristic of such a business is that their cash expenses are way lower their cash income. Phillip Morris, Kellogg and Coke are some of the very well documented companies. Companies that are in mature phase where they are ploughing only a part of their earned income back into business. These are companies that generate enough income to expand their business without needing to raise cash by selling more stock. 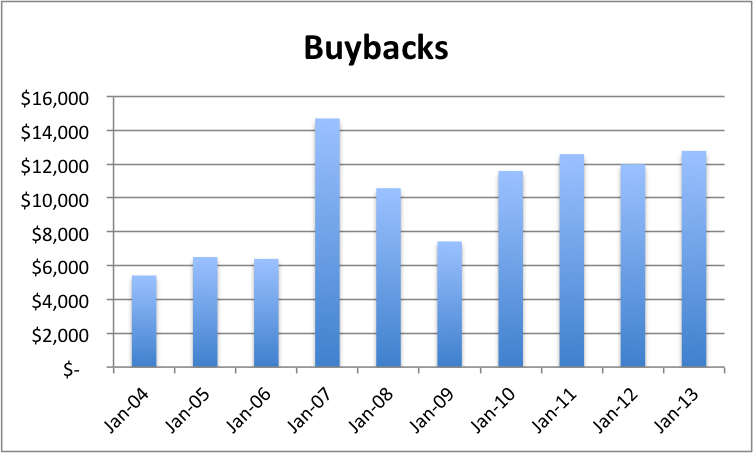 Companies where management is focused on creating value for shareholders, through dividends and/or buybacks. Companies that have raised their dividends for at least 10 years in a row. 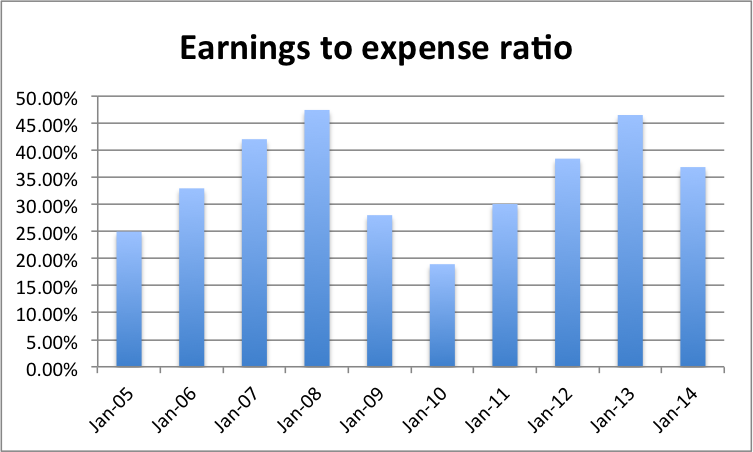 An organization's earnings don't always move up in a linear fashion. Almost every company inevitably goes through challenging times and their earnings are negatively impacted. The trouble(s) plaguing the company can either a temporary one or a severe blow that will be detrimental to future prospects of the company. At this critical juncture, an investor is required to make a 'sound' judgement call whether to exit the position, hold on or to add further. Additionally, the hoopla created by the media added to the mix, I find my ability to make a 'sound' judgement call severely impaired. This is where dividend raises come into picture. I use them as an indicator to assess whether the trouble company is facing is temporary or long lasting. Is my 'seek' checklist perfect? Off-course not. Does it also end up including awful businesses? I am sure it does, but hopefully the winners will outweigh the losers (handful of quality investment is all you need for a lifetime of financial freedom). Undoubtedly, I will make mistakes along the way but I hope to learn from my mistakes and continue to build my knowledge. I like to think of myself as a 'Value investor'. This is not to say that I avoid growth companies, it implies that I am not willing to pay a fortune in high fliers. In simple terms, I look for value regardless of how a company is categorized. I believe that every investor is different, and have unique goals and circumstances. No one particular investing style/strategy fits all investors because there are too many variables involved. Let me bring up an example to demonstrate my point, Warren Buffet has often said - "You should approach investing like you have a punch card with 20 punch-outs, one for each trade in your life. I think people would be better off if they only had 10 opportunities to buy stocks throughout their lifetime." Contrast that with Peter Lynch -"I've always believed that searching for companies is like looking for grubs under rocks; if you turn over 10 rocks you'll likely find one grub; if you turn 20 rocks you'll find two. The person that turns over the most rocks wins the game. And that's always been my philosophy." Not surprisingly, Peter Lynch at one point of time had has more than 1,500 stocks in his portfolio. While Warren Buffet has very low turnover in his portfolio, Peter Lynch often bought and sold stocks on a daily basis. This does not make any one of them right or wrong, both of them are one of the greatest investors of our time. The point I am trying to demonstrate is - one of the most important task for an individual investor is to ensure that he learns about different investing strategies and chooses the one that fits within his intellectual/philosophical framework. As an investor it is of paramount importance that we all understanding our shortcoming and limitations. Below is my attempt at understanding and articulating my shortcoming and strengths. I do not have the capability to time the market. Identifying the strongest business with favorable economic characteristics and wide moats is not one of my strength. For the sake of argument let us assume that I could find a business that I both understood, had favorable economic characteristic and a wide moat. I would still need to arrive at a price at which that investment makes sense, which bring me to the next point. Valuing a business in absolute range of dollar value is also not one of my strengths. Charlie Munger/Warren Buffet has often said, 'It's far better to buy a wonderful company at a fair price than a fair company at a wonderful price.' This requires one to be able to first identify a wonderful business and second arrive at a fair price through valuation. I believe that time in the market is more important that timing the market. There is no doubt that I would have been better-off starting investing earlier in my life. As they say, 'Time is on your side when you invest for the long term', I still have a good 35 years before I reach the 'official' retirement rate. Like most of the humanity I am fairly good at relative valuation. Research has shown that people are better at estimating relative sizes (A – C is twice as far as A – B, Basket X is about 1/3 the weight of Basket Y) than coming up with absolute estimates (A to B is 15km, Basket X is 7.5kg). I find relative valuation much quicker; and I need less information to get started. I am a voracious reader have a strong inclination to learn. One important thing to note is that I do not take these shortcomings as immutable. By continuously learning about investing I aim to slowly and gradually overcome my current shortcoming and strengthen my strengths. I do not have any lump-sum money to invest. I work in a full time job and have used all of my saving so far in the purchase of my home (mortgage). My investment savings come from my monthly paycheck. I have concluded to invest in market on monthly basis. This decision has more to do with my current circumstances, although it does effectively put me under the dollar cost averaging camp. I do, however, understand that there are arguments both in favor of and against dollar cost averaging. 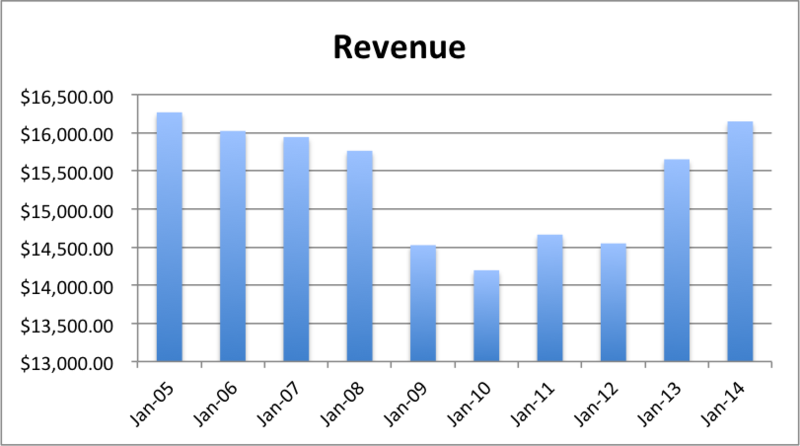 Revenue is likely to stay flat in coming years. The technology (both software and hardware) sector is marked by a constantly changing arena, IBM will need to adapt to changes in addition to fighting competition. IBM's strategy is to adapt to changes in the tech arena by getting out of lower-end business and making a foray into software and higher-value services with a focus on cost reduction through acquisitions. Its in the enterprise software, services and hardware business and is an industry leader in each of its businesses. In the early 1990s, IBM started moving away from its reliance on mainframes towards software and higher-value services with a focus on cost reduction. The company creates business value for clients and solves business problems through integrated solutions that leverage information technology and deep knowledge of business processes. IBM solutions typically create value by reducing a client's operational costs or by enabling new capabilities that generate revenue. IBM has a significant global presence, operating in more than 175 countries, with an increasingly broad-based geographic distribution of revenue. The company continues to invest to capture the long-term opportunity in markets around the world that have market growth rates greater than the global average—countries within Southeast Asia, Eastern Europe, the Middle East and Latin America. The company's major markets include the G7 countries of Canada, France, Germany, Italy, Japan, the United States (U.S.) and the United Kingdom (UK) plus Austria, the Bahamas, Belgium, the Caribbean region, Cyprus, Denmark, Finland, Greece, Iceland, Ireland, Israel, Malta, the Netherlands, Norway, Portugal, Spain, Sweden and Switzerland. In 2013, IBM was awarded more U.S. patents than any other company for the 21st consecutive year. Outsourcing and Systems integration - 60%. Software and services business has a high switching cost. Sticky - Reoccurring revenue stream. As an example, migrating mainframe based application to alternative architecture can be expensive and risky. When considering infrastructure-management software, IT personnel rely on it to operate their data centres and are reluctant to switch to new, less familiar systems. Cloud computing (Hardware): With computer resources increasingly delivered by cloud providers, demand for IMB's high-end servers could weaken. Cloud computing (Software): As software-as-a-service gains wider adoption, demand of IBM software could weaken. IBM is facing increasingly competitive pressure from Oracle and Cisco in hardware segment from commodity x-86-based servers. Custom software development approach being challenged by Oracle's cheaper integrated solutions that aims to meet 80% of customer requirements. Big data is a hot and growing industry with fierce competition. 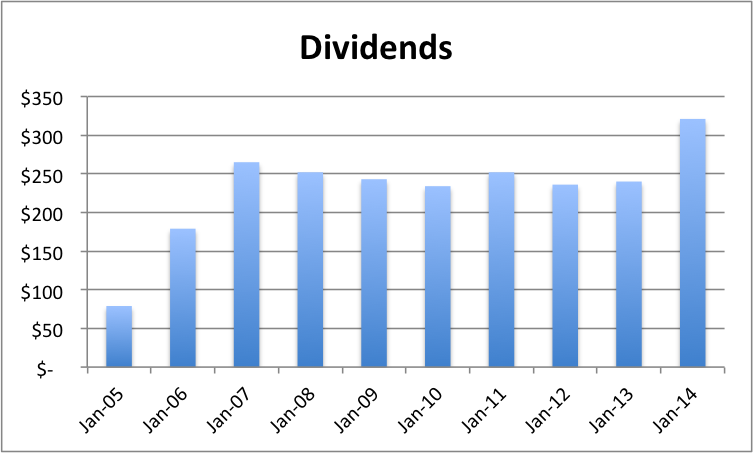 Dividends: The company has increased dividends for 19 years in a row. The current payout ratio is 25%. IBM has shed roughly $7 billion in low-margin revenue through its recent divestitures of its customer care, System X and microelectronics businesses. The company sees weaker demand profile and plans to restructure of its workforce. Apple and IBM announced an exclusive partnership to further promote and deliver iOS to the enterprise customer with IBM developing and selling big data and analytics apps for the iOS platform. Mainframe markets is unlikely to grow, but will continue to provide steady flow profits. Revenue growth is likely to stay flat in coming years. 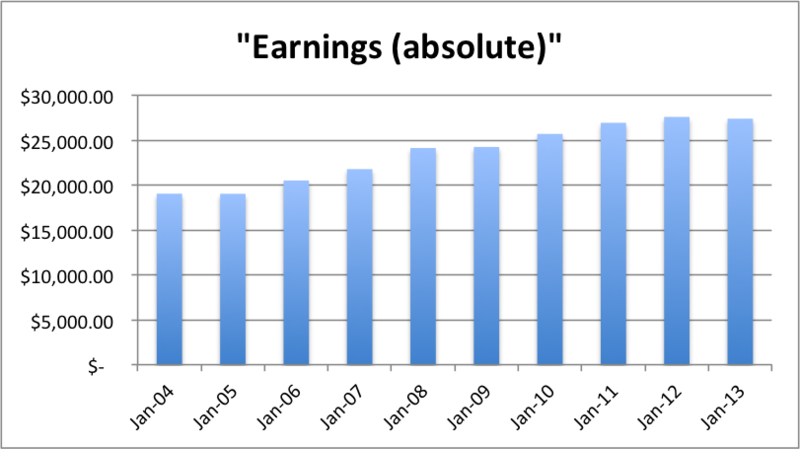 In the last 10 years, the absolute earnings have increased at an average of 4.19% and at a CAGR of 4.12%, which puts it in under 'Slow growers' category. 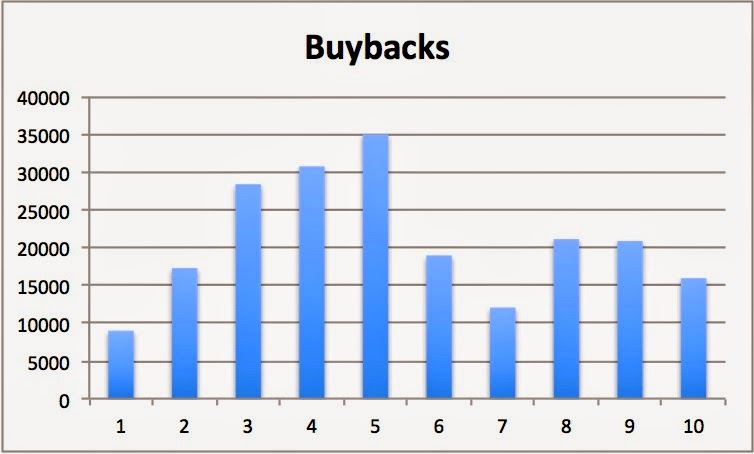 Due to the effect of share buybacks, the EPS on the other hand has grown at an respectable average of 14.78% and at a CAGR of 16.61%. In the last 10 years, IBM has spent an average of 48% of its owners earnings on 'R&D', 'Property, Plant and Equipment' and 'Purchase of business'. 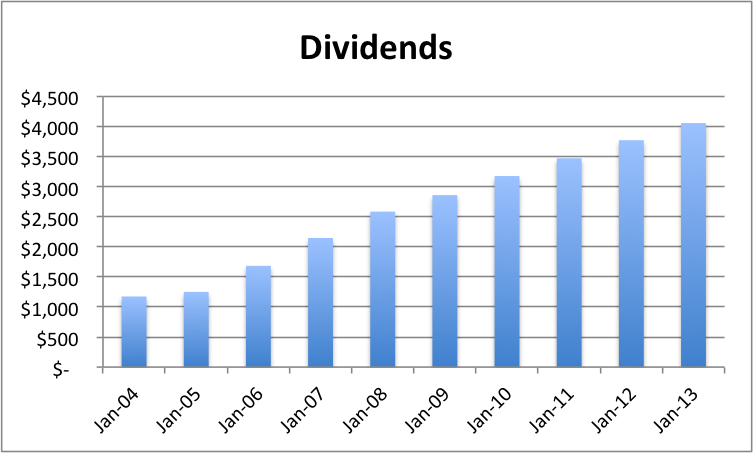 IBM has increased dividends for 18 years in a row, which satisfies one of my investment criteria. 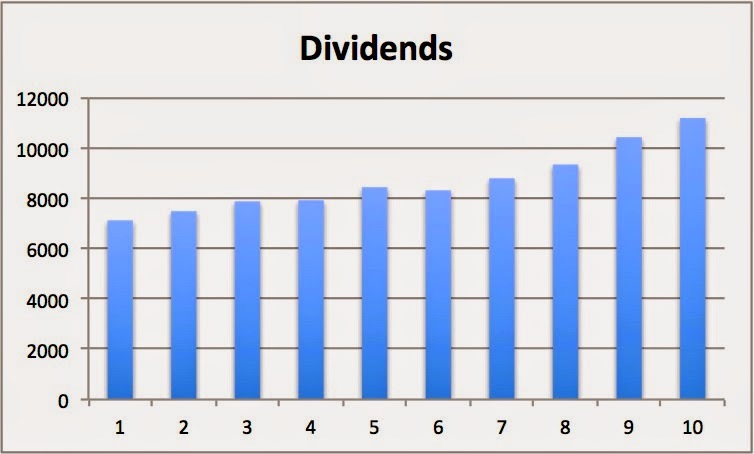 In the last 10 years, the dividends have increase at an average of 15.15% and at a fantastic CAGR of 14.78%. Due to the effect of share buybacks, dividend per shares on the other hand has grown at an average of 20.76% and at an extraordinary CAGR of 20.32%. A CAGR of 20.32 implies, dividends doubling evert 3.5 years. 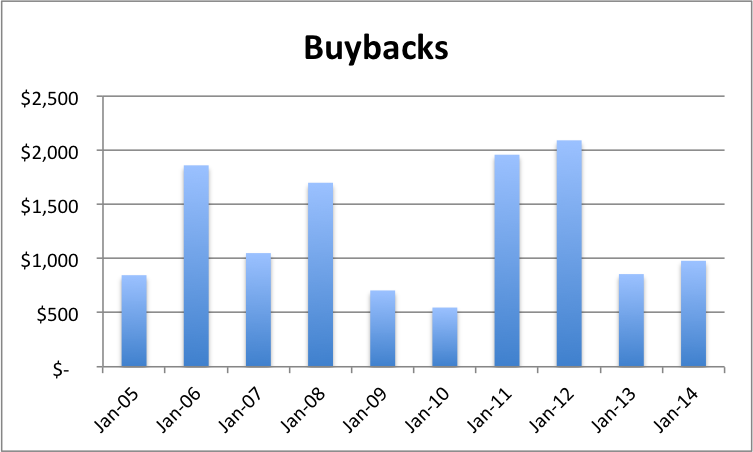 The graph below outlines the total amount of money IBM has spent on buybacks. 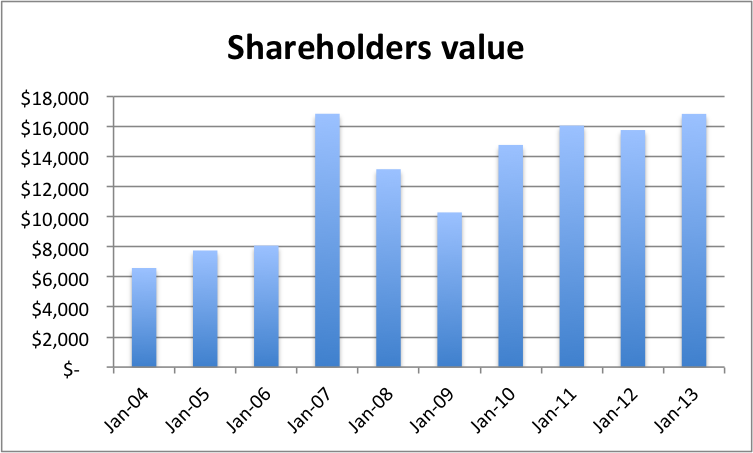 IBM has been able to manage to bring down the total number of outstanding shares (diluted) from 1,707.2 million in 2004 to 1005.1 million in 2014, thereby reducing the total outstanding shares by whooping 41%. 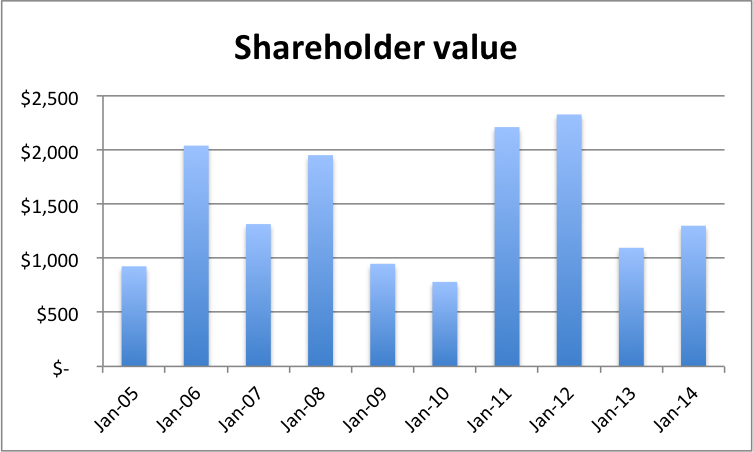 The graph below outlines the total amount IBM has returned back to shareholders in the last 10 years through dividends and share re-purchases. On an average IBM has been able to return 50% of its total owner's earnings to shareholders through dividends and share buy backs. 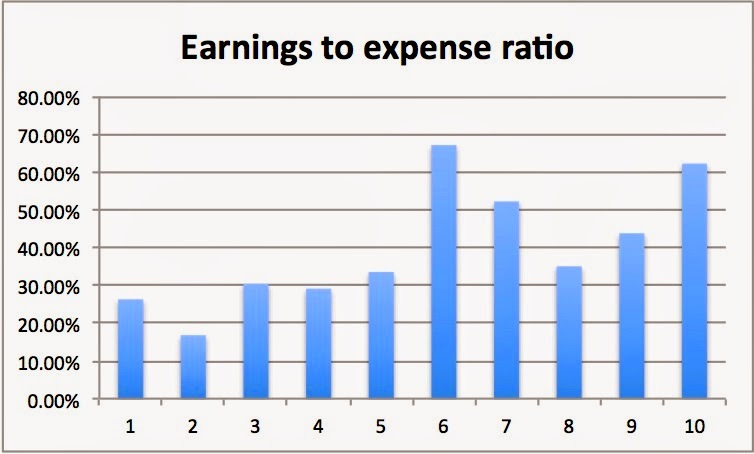 The total liability to earnings after capital expenditure is 6.24 which is phenomenal. Big Data: The company has invested more than $22 billion, including $15 billion on more than 30 acquisitions, to build its capabilities in big data and analytics. Cloud computing: The company has invested over $6 billion to acquire more than 15 companies related to cloud, and is investing more than $1 billion to expand its global footprint to 40 datacenters worldwide. IBM now has more than 100 SaaS offerings, and IBM cloud supports 24 of the top 25 Fortune 500 companies. Systems of engagement: IBM has acquired 20 companies related to mobile, social and security. IBMers are collaborating in more than 200,000 internal social communities and 85 percent of IBM's sellers use the company's Sales Connect portal. Acquisitions, Alliances and Dispositions include Integration Challenges, Failure to Achieve Objectives, and the Assumption of Liabilities. Acquisitions often (two-thirds) fail to deliver the financial benefits that are envisaged.